The more time I spend on Florida rivers, the more I’ve come to feel that the river cannot be rushed, that the longer the paddle, the better. However, with this paddle, I discovered that when time does not allow for a long, leisurely paddle, a “quickie” paddle can still satisfy the senses—at least for the moment. My sister, Missy, and I paddled Spruce Creek in Port Orange on a Sunday morning in May. Now, although my guidebooks recommend putting in at the eastern end of the creek, near Strickland Bay and Spruce Creek Park, we opted for a location closer to us, and we put in on the upper, western end, renting our tandem kayak from Cracker Creek Canoes in the privately-owned Spruce Creek Preserve. Spruce Creek originates not far from this point, in the freshwaters of the cypress swamps. To the west, there is less than a mile of waterway that can be navigated. To the east, it’s less than 8 miles to Strickland Bay. We didn’t want to miss the wild section of the river, so we began our paddle by heading west on the narrow, winding blackwater stream. It didn’t take long to realize why this little creek is both an Outstanding Florida Waterway and a Florida Designated Paddling Trail. 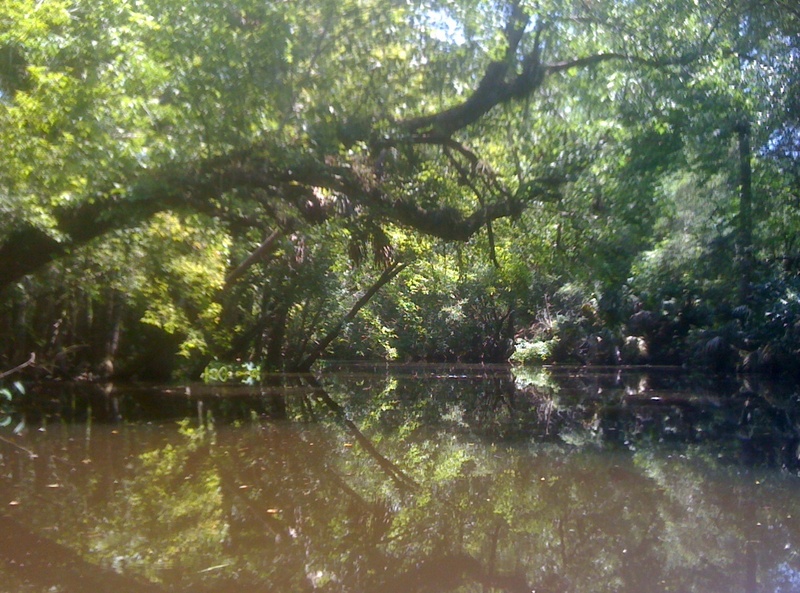 We gazed upon the picturesque creek, shaded by overhanging oaks, maples and cypress reflecting in the dark water. On the left, high banks led up to wooded areas and one, maybe two homes tucked away. To the right, the water spread out, seeping into the low cypress wetlands. Deep in the woods, the birds called to each other from the trees. The further west we paddled, the more we had to skirt around or duck under fallen trees. It took us less than 30 minutes to reach a point where the narrowing creek and downed trees forced us to turn around and paddle back east. Now, heading east, past our put in, the creek widened. Two great blue herons greeted us, flying up the river. A cormorant sat atop of a pole in the water, seemingly unbothered by the company. Woodpeckers tapped away, busy at work on an overhanging tree. We could see and hear the mullet jumping around us, close enough to get us wet as they flopped gracelessly out of the water. We saw schools of them below us, swimming in the dark water. If we had paddled further, we would have noticed even more of a change in the creek. As it nears Strickland Bay, the creek and its surroundings become more estuarine with grass flats, salt marshes, and mangrove forests. But, alas, our time was up! We turned around and headed back to our put in.